(+) 24/06/2008 - Page moved to a new server. (+) 12/07/2006 - Version 0.27 released. This adds HTML export using CSS (demo) and multiple attributes per character support. Also, you can now move in dialogs using PgUp, PgDn, Home and End keys and function keys' order is changed. Some minor bugfixes. Available here: cavewall-0.27.tar.gz (31 kB). (+) 08/07/2006 - Version 0.265 released. Menu code cleanup and major HTML export bugfix. Available here: cavewall-0.265.tar.gz (31 kB). (+) 06/07/2006 - Version 0.26 released. We have a simple menu under F1, color/background, character attributes and cursor step mode selection dialogs and basic HTML export. 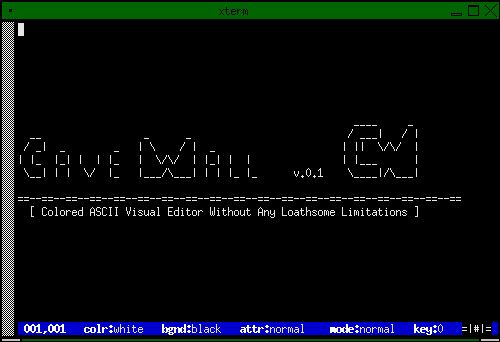 You can download CAVE WALL 0.26 here: cavewall-0.26.tar.gz (31 kB). (+) 24/10/2005 - Cave Wall site is up again. (+) 21/08/2004 - Version 0.25 released. This adds block selection highlighting, paste with transparency support, removes a few minor bugs, makes some functions use default colors from config.h. And enter/return key now officialy clears to the end of line. 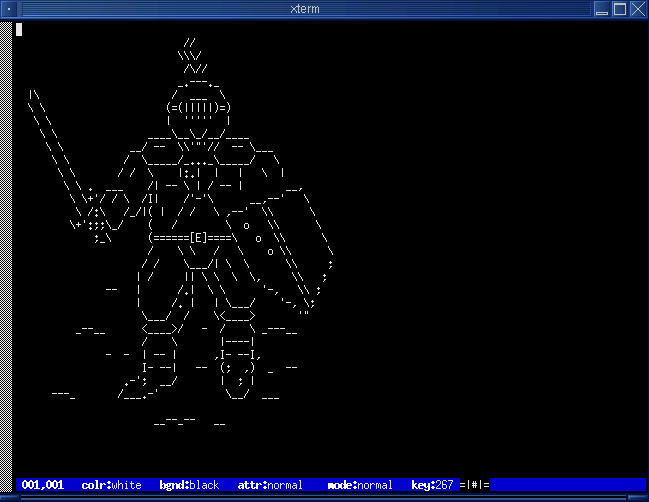 You can download the new version here: cavewall-0.25.tar.gz (27 kB). (+) 28/07/2004 - Version 0.21 released. Removes a bad bug in import that cut out parts of image larger than current edit pad and some bugs, mostly in undo saving, including some that caused segmentation faults. Plus a 10kB README file, redo support and support for giving filename as command line parameter. You can download it here: cavewall-0.21.tar.gz (26 kB). (+) 14/07/2004 - Version 0.2 released. Changes include support for images up to 1000x1000 characters, interpretation of more ANSI codes, optional character conversion in mirror block operations (converts slashes to backslashes, etc.) and some bugfixes. 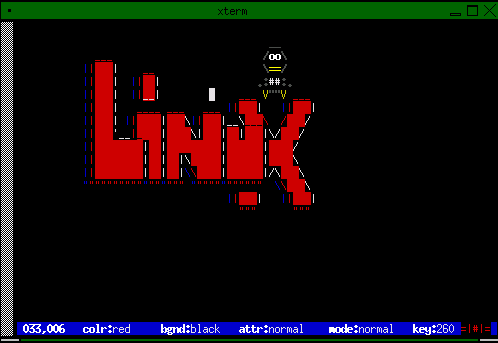 You can download it here: cavewall-0.2.tar.gz (24 kB). (+) 30/06/2004 - The site was created, big thanks to OSH (dead link) for hosting it. 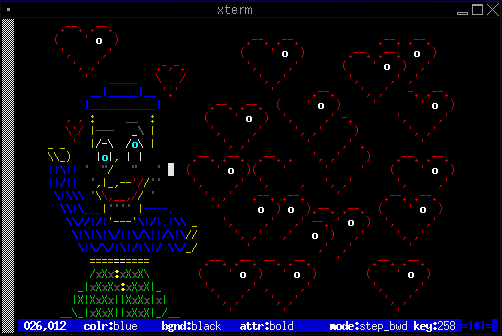 CAVE WALL (Colored ASCII Visual Editor Without Any Loathsome Limitations) is an ASCII Art editor for Linux, somewhat similiar to such programs as JavE, Aewan, DuhDraw or EDASCII. It is distributed on the terms of GNU General Public License. At the time it is in early development stage, but usable. 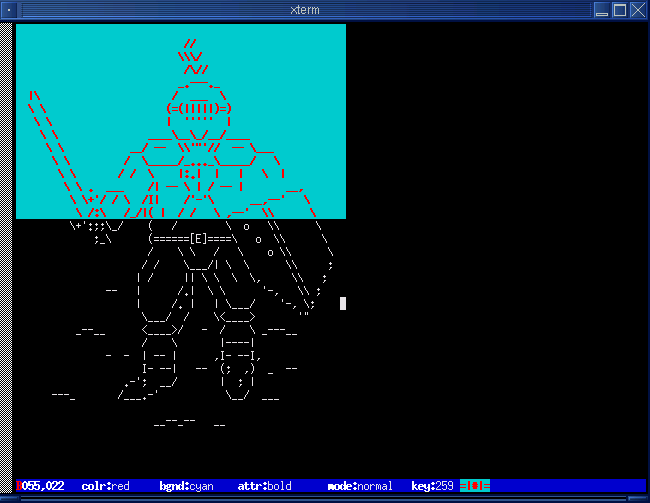 It's written in C and the interface is based on the ncurses library. The project, originally named CAVE, was started in 2002 by Michal Miszewski, then left for a while, and revived in 2004 by me. The name was changed because it had already been reserved by some other project. CAVE WALL is my first bigger project and I took it up mostly in order to learn a bit of C programming. shape drawing - lines, rectangles, circles, etc. Here you can download CAVE WALL sources.